The original Swagway (also known as the X1) is one of the most popular self-balancing scooters on the market with a good build quality and excellent value for money. Being relatively cheap when compared to other hoverboards it’s a great choice for beginners and those who want to have fun with the latest and greatest gizmo without breaking the bank. Because self-balancing scooters do not have to be manually operated like skateboards or kick scooters, they are a great gift for anybody who wants to enjoy the feel of skateboarding without the physical effort. In this review we’ll go over the finer points of this product including the specs and weigh in with our thoughts. Note From The Editor: Looking to buy the Swagway X1? Purchase from the official store here! The 100-240V input battery on the Swagway just keeps going, and going, and going! Reaching a full charge in around 1 hour, you are then free to zip around on the toy for around 5 hours until it finally begins to run out of steam! On the downside there has been the odd report of dead batteries, but fortunately a quick phone call to the company and they'll fix you up with a new one. Update: The reported battery issues have now been fixed. The latest models come fitted with Sentry Shield protective casing to prevent damage to vital internal components. Distance Coverage 32 kilometers (20 miles). This can vary based on factors including the weight of the rider and the type of terrain you are riding on. A heavier rider and tricky terrain such as grass is likely to reduce the distance you can cover. Speed 3 kp/h - 16 kp/h. This scooter is a real speed demon hitting speeds up to 16 kp/h (around 10 mp/h). This makes it one of the fastest scooters we've reviewed! The Swagway X1 can accomodate riders who weigh up to 222 lbs. Kicking things off with the build quality and design, this board is relatively lightweight and compact yet at the same time has a sturdy feel to it thanks to the hard ABS outer-casing which we really appreciated. It feels like a product that will stand the test of time and withstand any knocks it may suffer as a result of playful children. The wheels are also well made with good materials, featuring aluminum rims and rubber tyres. The use of aliminum metal, again, helps to add to the premium feel of this product. When it came to the physical appearance, the first thing that we noticed before even powering it up for the first time were the colors which are wonderfully vibrant and eye-catching. Even the black color scheme has a nice gloss to it which helps it to stand out amongst the crowd! The purple LED lights (positioned at the front of the two motors) which turn on once you step onto the board’s pressure sensitive pads are pleasantly bright and funky, what’s more, they look really sci-fi at night! In terms of reliability, thanks to the ingenious addition of a “Sentry Shield” (a special type of protective chamber which keeps the battery safe from damage) the battery faults seen with the earlier models are a thing of the past. Somebody deserves a raise! A very solid build with a head-turning design! This is an area where the X1 shone! The speed of this board is a lot faster that most other hoverboards we’ve tested, with a maximum speed of around 16 kp/h! If you’re not a speed demon, don’t worry, because it’s also easy to tune the speed down to a much slower pace, all the way down to a very controllable 3 kp/h in fact. If this is your first time riding a self-balancing scooter you might want to start off slower and build your way up to the big 16 before jumping right in or you might just end up face-first in the garden bush! Same goes for children, it’s better to play it safe and set the speed lower for young riders. Speed can be set by the user, randing from 3 kp/h to a very impressive 16 kp/h! The perfect self-balancing scooter should handle like a dream, and this product did just that! A little pressure goes a long way and turning in particular feels natural, almost like rollerblading without the steep learning curve. Even the less experienced members of our crew were able to ride this device around the office straight out of the box without knocking into every item of furniture! The two smart motors built into the gadget recognize when you are not applying pressure correctly which helps even more to prevent accidents and give you better control. With that said, because of how fast it is you might want to start things off slower until you fully master the control mechanics. The use of rubber tyres helps a lot with the grip. Even though, like other self-balancing scooters, it handles much better on smooth surfaces such as wood flooring, it can travel across grass in a pinch. Handles so naturally it feels easier than using roller skates but with the same elegant “flowing” feeling when turning. Again, this is something else which really impressed us about the X1. Most self-balancing scooters sell for around $700 (or even higher!) while this nifty little gadget sits at a wallet-pleasing $499. In terms of value, the quality of product you are getting for the pricepoint is excellent with the board being comparable to many higher end models we reviewed including the Doinshop which commands prices of up to $899. 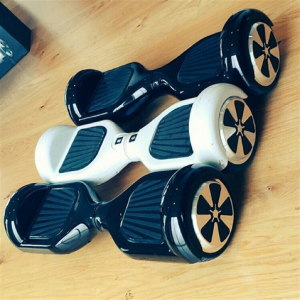 Cheaper than most other hoverboards without compromising on quality! Can’t wait to get your hands on your new toy? 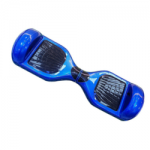 Use our special link and get the board at the best price! The price is very appealing compared to other self-balancing scooters. The board is very well made and feels like it is solidly built. Again this really impressed us given the pricepoint. This scooter is one of our favorites when it comes to design. It looks well-made even from a distance and the LED lighting stands out particularly in low lighting. The company have decided to make individual parts (for example LED lights) available for purchase, which means if you have an accident and need to replace anything it couldn’t be simpler. The ABS material used to create the casing looks great and does a good job of protecting the inner core components which keep the Swagway working, but it can get scratched if you’re not careful. Though we personally did not experience any technical issues, there has been the rare report of parts such as the battery failing to work after a period of time in older models, or other malfunctions. Because of this, you should avoid purchasing a used Swagway and instead buy them new from reputable vendors such as Amazon.